How Do I Become a Disciple of Jesus in the Catholic Church? Jesus invites each of us to Come and See. “Journey,” Holy Martyrs’ version of Rite of Christian Initiation of Adults, is a process through which unbaptized men and women enter the Catholic Church. It includes several stages marked by a deepening relationship with God, study, prayer and celebration of rites at Mass. Participants in Journey are known as catechumens. Journey is also for adults who may have been baptized when they were younger but were never raised in the Christian faith. All participants undergo a process of conversion as they reflect on the Gospel, profess faith in Jesus and the Catholic Church, and receive the sacraments of baptism, confirmation and Holy Eucharist. The Journey process follows the ancient practice of the Church that was restored by the Second Vatican Council as the normal way adults prepare for baptism. Prior to formally beginning the Journey process, an individual comes to some knowledge of Jesus Christ, considers his or her relationship with him and is usually attracted in some way to the Catholic Church. This time period is known as the Period of Evangelization and Precatechumenate. For some people, this process involves a long period of searching; for others, it is a shorter time. After this time of evangelization and precatechumenate, a person moves into the period of the catechumenate, which lasts for at least one year but can extend beyond that. It all depends on how the person is growing in faith, what questions and obstacles they encounter along the way, and how God leads them on this faith journey. During this time, the catechumens consider what God is saying to them in the Scriptures, what changes in their life they want to make to respond to God’s inspiration, and what membership in the Catholic Church involves. 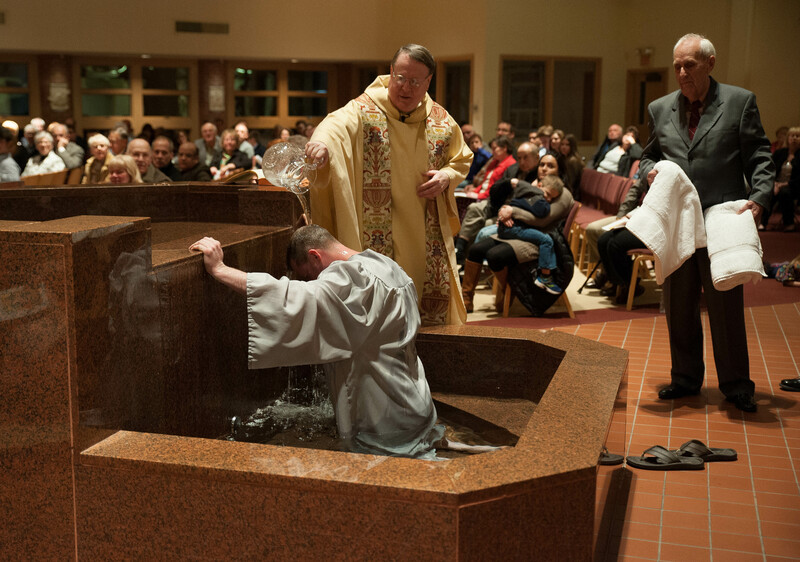 Adults who have been baptized in other Christian traditions and are grounded in the Christian faith share a different journey as they prepare for full initiation or to be received into full communion with the Catholic Church. This process is called “FOCUS” and it is designed to address the questions of mature Christians from other traditions. FOCUS meets participants “where they’re at” and respects their already-deep understanding of what it means to live a life of discipleship to Christ. It involves sessions that are offered once a year but also entails immersion in the life of the parish community. Jesus gently invites each of us, saying to those who are searching, “Come, and you will see.” We want to welcome you to travel with us and encourage you to bring us your questions and hopes. When you are ready to begin your Journey, please contact Janet Payton, Pastoral Associate, 330.722.6633.